Editors' note: Last week, the UK's Channel 4 ran a multi-format series called The Great British Food Fight, featuring different programs with Gordon Ramsay, Hugh Fearnley-Whittingstall, Heston Blumenthal, and Jamie Oliver. Eat me daily will be reviewing all of these shows this week. Today, we're covering Heston Blumenthal's Big Chef Takes On Little Chef. We're including video clips, because (a) these shows are all very good, and (b) it's unlikely that these programs are going to air anywhere else outside of the UK. If you want to see them... well, we obviously don't suggest you pirate them. That would be illegal. 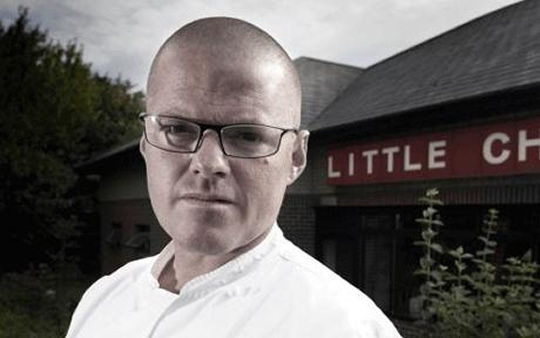 Big Chef Takes On Little Chef is a three-part documentary in which chef Heston Blumenthal, of the Michelin three-starred Fat Duck, is charged to remodel and reinvigorate the Little Chef chain of 180 roadside restaurants. (US readers: the closest match would probably be Denny's or Big Boy.) The highly conceptual Blumenthal, sometimes called the world's greatest chef, is an unlikely fit to revamp a "fading national treasure" corporate chain where the maximum price of an entree is £9.49. As we watch him overhaul the menu, rebuild the restaurant, and motivate and train the waitstaff and cooks, Blumenthal constantly reiterates that his reputation is on the line as he's being used in what he fears is all just a PR stunt. And it's true, he encounters some fish-out-of-water challenges along the way: executives who speak in corporate babble and claim his initial menu lacks a "wow" factor; untrained cooks; kitchens equipped with only a griddle and microwaves. But the biggest challenge of all is one that transcends the haute/quotidian fence: revamping the menu. To pull that off, Blumenthal needs to find a way to modernize classic British cuisine, while not alienating customers, all at criminally-difficult low prices and profit margins. To smooth that goal, Blumenthal gets an assurance from corporate that they won't change any of his menu without his permission. (We've got a copy of the temporary menu which you can download (pdf).) The redesign includes small, Blumenthal touches: The fish and chips comes with a "smell of the chippy" atomizer of the juice from pickled onions (to remind of a chip shop), and the bathrooms pump in the smell of coffee and have music and George Dawes recordings playing in the background. The graphics and interiors were also completely revamped. Big Chef Takes On Little Chef pulls of the curious feat of being both a revealing look at what goes on inside corporate chains, and a humanizing portrait of the sometimes superhuman Heston Blumenthal. We assume there'll be a follow-up series. We can't wait.